Michael (Admin) | Sep 30, 2009 Entertainment, WTF?! 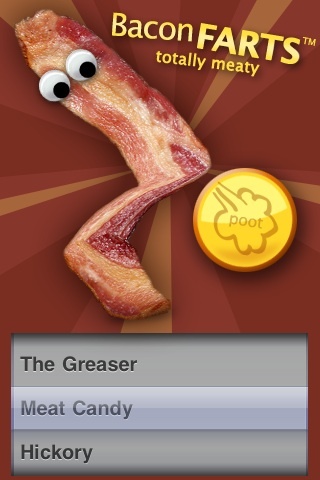 Another fart app! Yawn. *sorry* I mean WTF! It’s bad enough that an App Store search for “fart app” brings up no less than 96 results, but do we really need to add flavor to the mix??!! BaconFarts has a funny name and a delicious theme but, on the inside, it’s just another fart machine, and a pretty plain one at that. If the name of this app reminds you of that little April Fool’s prank I dubbed Scent of a Chicken, I’m very sorry glad to report that the promise of meaty smells emanating from your iPhone is still just a fantasy. Don’t get me wrong… I enjoy ripping a loud, juicy one as much as the next guy, but even I’ve had enough of the farting. Come on Focal Point, make something that’s actually worth a buck!